On the morning of July 26th – the day of the fast of Tisha B’Av – Israeli security forces had to deal with an incident at Al Aqsa Mosque on Temple Mount in Jerusalem. “Dozens of masked Palestinian protesters hurled rocks, Molotov cocktails and firecrackers at police officers on the Temple Mount compound in Jerusalem’s Old City Sunday morning, before being pushed back into the Al-Aqsa Mosque by security forces who were rushed to the area. The portrayal of that incident provided to visitors to the BBC News website’s Middle East page creates a markedly different impression. 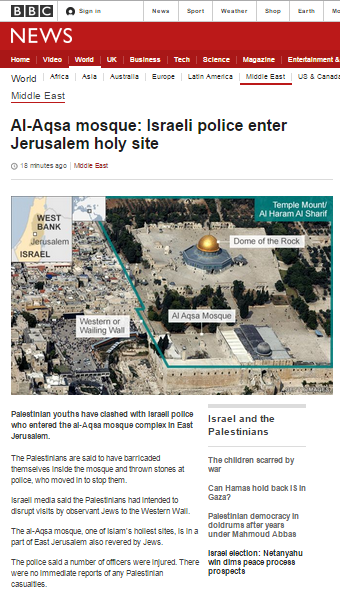 The report’s headline – “Al-Aqsa mosque: Israeli police enter Jerusalem holy site” – erases any mention of what preceded the security forces’ brief entry into the mosque in typical BBC ‘last-first reporting’ style. The opening paragraphs of the article even imply that the violence on the part of the Palestinians was a reaction to the police’s entry into the mosque. “Palestinian youths have clashed with Israeli police who entered the al-Aqsa mosque complex in East Jerusalem. No mention is made of the fact that the rioters had stockpiled rocks, planks, fireworks and Molotov cocktails inside the mosque in order to facilitate that ‘disruption’ or of the fact that the plan was timed to coincide with Tisha B’Av, which sees a high number of visitors to the holy sites. Audiences are not told that Temple Mount is the holiest site in Judaism and, in addition to having failed to clarify that the incident occurred on Tisha B’Av, the report makes no mention of the fact that the fast commemorates the destruction of the two Jewish temples on that site. “The police said a number of officers were injured. There were no immediate reports of any Palestinian casualties. As the BBC could have discovered directly from the Israeli police, three Palestinians were in fact arrested rather than six and four police officers were injured. As we see, the BBC’s report focuses on the entry of policemen into the Al Aqsa Mosque. The issue of Palestinians intending to use violence to prevent Jews from exercising their religious rights is not apparently a topic about which the BBC considers its audiences need to know more.